This cereal is really good. It's loaded with cinnamon and graham flavor. It has a light sweetness - a sort of delicate middle ground between sugary kids' cereals and adult health-conscience cereals. As the "cinna-graham" flavor subsides in the mouth, you taste the corn & oat... reminding you of original Honey-Comb Cereal. If you like Honey-Comb Cereal, graham crackers and cinnamon, I can almost guarantee that you'll enjoy this cereal. Since some 90% of Americans enjoy these flavors*... I declare Cinna-Graham Honey-Comb a winner. * This percentage is based on informed opinion and in now way reflects the actual percentage of Americans who enjoy these flavors. Nutritional considerations: Each 1 and 1/2 cup serving contains 130 calories, 1.5 grams of total fat (0.5 grams saturated fat and 0 grams trans fat), 0mg cholesterol, 190mg sodium, 27 grams total carbs, 2 grams dietary fiber, 10 grams sugars and 2 grams protein. This cereal's golden egg rating of 5.6 has been rounded up to 6 golden eggs. 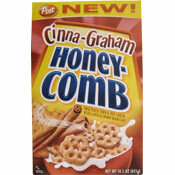 What do you think of Cinna-Graham Honey-Comb? Did they stop making it? Love it and can't find it anywhere. Cannot find this cereal anywhere. I found it at Walmart two times, that's all. Would like to find a store locally. 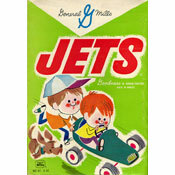 What happened to this cereal? Why is it missing in action? Did the Post company discontinue production? If they did, BAD MOVE, unless something is wrong with it and they aren't telling! anyone have answers? my wife loves this stuff. I'm not sure its Wal-Mart that is the culpret. I shop there almost exclusively, and cannot find this cereal, anymore, and have checked Kroger, and other grocery stores, and its not on the shelves. I bought two boxes today on clearance at a local Food Town grocery store. I got hooked on this cereal and just as I did Wal-Mart stores where i am quit carrying it. What a shame because it is hard to find. I am obsessed with this cereal. I'm hoping it sticks around, like the chocolate honey comb. I always keep a stockpile of about 5 boxes just in case they stop making it!